The history, theory, and methodology of each of eight different qualitative research methods is described by a researcher using it in the field. Each chapter is accompanied by a special education–related study that illustrates the method. This text demonstrates how qualitative research is particularly suited to investigating the experiences of students, teachers, school leaders, and families, as well as the meanings or attributions associated with those experiences. School culture, patterns of participation in school-related activities, and the impact of those activities on a student’s performance are among the phenomena that productively yield to qualitative approaches. 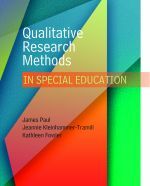 The introductory chapter provides an overview of qualitative research methods and a historical perspective on applications in special education. The concluding chapter discusses the implications of qualitative research for improving practice and providing useful knowledge to inform policy and teacher education.